We bought this exquisite sapphire direct from of a Mogok miner. With eye pleasing pastel yellow color and sparkling crystal clear clarity. This emerald cut natural Burmese sapphire is priced at a bargain, just for you. A big face makes this ideal for a ring or other jewelry project. 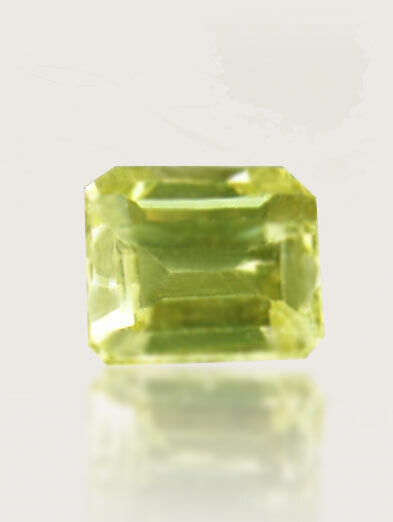 Approximate dimensions are as follows; 5.5 mm x 5 mm x 2.5 mm deep and weight is .79ct. Yellow sapphires are most beneficial to the Zodiac signs of Sagittarius and Pisces. Yellow sapphire bestows innocence, truth and good health, and has traditionally been a popular choice amongst Royalty, often having been used in engagement rings as an alternative to Diamonds. It is the most beneficial to the authors, writers, barristers, traders and businessmen.